Hello sports and horse racing fans! Show your spirit for your favorite pro, college or high school team, or your favorite horse racing stable with a custom painted hitch from horsehitches.com! Match up colors that coordinate with your house or patio too- horse hitches make excellent ornaments complementing any horse-related, horse racing or western style decor. Our hitches are ideal to paint "two-tone" in contrasting colors: one color for the head and one color for the base. Our horsehead hitch can also be painted all one color too- we have 18 colors to choose from. It's easy to personalize your hitch with a custom paint job. Use our convenient online order process to let dress up your hitching post just the way you want. You pick the colors and where you want them- just like back in the early 1900's when people wanted to make their horse hitch stand out from all the black ones! Order your custom painted hitch using our simple 2-step process and online order form: Click the "Order Now" button, pick the location(head or base) and then pick the paint color on the form, and then checkout using a credit card. With 18 colors and 2 locations, you can take your imagination to the limit! We offer 15 standard Rustoleum gloss oil-based paint colors: 2 greens, 2 reds, 2 blues, brown, yellow, white, burgundy, orange, gray and black. From our experience, the standard Rustoleum paints work the best because they are more color-fast, wear better, are of the best overall quality, and are readily available at any Walmart, Lowes or Home Depot for future repainting. Painting a horse hitch costs over $50 in paint and materials, in addition to about 2 hours of painting and detailing labor making a mess splattering paint everwhere and breathing hazardous paint fumes. For a professional job, save time and money by ordering a custom hitch and let our talented painting experts do all the hard work for you! Another option is to buy a UNFINISHED HORSE HITCH and do it yourself. Custom painted horse hitching posts are painted with gloss oil-based enamel- the same kind of paint used on farm machines that are used a lot and face the elements. Paint is chip, fade, and UV resistant and will last for many years. The statue itself is made of non-rusting Aluminum so it too will last for generations. 100% hand-painted in the USA to your specifications! Our craftsmen are highly skilled and take pride in manufacturing these fine metal sculptures out of the most durable materials. Unlike mass-produced Chinese items made of cheap poly resin with wash-off paint that are designed to only last for months, our individually-crafted metalworks coated with TWO COATS of the highest quality hard-shell oil paint will still be in style and service for years and even decades from now. 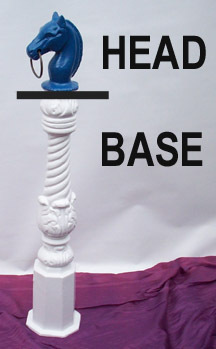 In the example above, the head is #5 Royal Blue and the base is #7 White. Want your horse hitching post painted to match your team colors? CLICK HERE to download a pdf file with all the official college and pro team colors so you can match them up with our standard and designer colors. Hitching posts add the finishing touches of decorator perfection to your yard, porch, patio or stoop. Horse hitching posts can be used for their original purpose of tying a horse and have unlimited uses at your home, business, or stable. Hitches make great christmas gifts for all the horse lovers on your list and make wonderful house-warming and birthday presents year round. Use horse hitches at entrance gates, buy several to border a trail or terrace linked together with a chain, set them next to a matching jockey hitching post, anchor them in concrete to use as bollards for preventing vehicle access, or wire them for electricity and light a walkway or entrance. A removable steel ring is included for the horse's mouth- you can also hang a sign, flower basket, or lantern there too. Units are hollow and can be easily drilled through for adding electrical wiring for lights, etc. Depending on whether your use for the hitching post is decorative or functional, there are 3 basic options for installation. 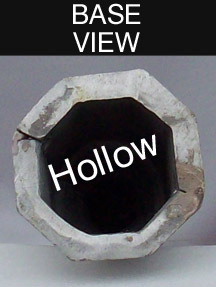 The hitching post can stand by itself on it's base, but is usually permanently glued to concrete for decorative use(epoxy paste kit included), or anchored to a concrete base with mechanical attachments(4 holes need to be drilled) or embedded into a hole in the ground or wet concrete for functional use. CLICK HERE for installation details. Approx 44" tall. Outside dimensions of base are 8" x 8". Ships by Fedex Ground in cardboard box. Shipping wt. 30 lbs. Free ground shipping to CONTINENTAL US only. Time from order placement to delivery is approximately 2 weeks. CONTACT US for international and other shipping options. Total price: $200. Shipping: FREE. 1. First write down the color(s) you want on a scratchpad. You can paint the hitch all one color too. Then click on the "Order Now" button below. 3. A payment gateway form will come up. Click on the "Buy Now" button. 1. RIGHT AWAY: Email receipt for your credit card payment confirming that your order has been placed. 2. WITHIN 5-7 BUSINESS DAYS AFTER ORDER PLACEMENT: Email with SHIPPING INFORMATION(tracking #). If you are shipping the hitch to a different address than billing address, we will automatically ship the hitch as a gift item from you with NO invoice or advertising from us. Custom painted horse hitch: $200 with FREE SHIPPING! CLICK HERE to order a UNFINISHED horsehead hitching post. 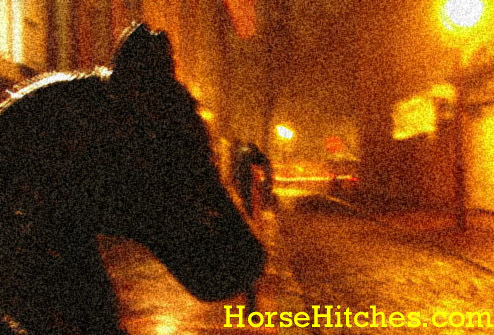 CLICK HERE to order a CLASSIC BLACK horsehead hitching post. CLICK HERE to order a LAWN JOCKEY hitching post.